I love weddings. It’s a party to celebrate two people in love. That’s a pretty awesome excuse for a party. Small weddings, big weddings, formal weddings, casual weddings. All make me happy. I’ve been to plenty of weddings. Twelve in 2009 alone! But of all the weddings I attended, my favorite was obviously my own. It was a PARTY! We had yummy southern food, plenty of drinks, an amazing DJ and hours of ridiculous dancing. And my hair? Totally perfect. But, the perfection of day wasn’t just about the party (or the hair). Those were just an added bonus. The perfection was found in the love. The love I had (and have) for Brett. The love proclaimed and blessed before God. The love flowing from the friends and family in attendance, most of whom had traveled hefty distances to celebrate with us. Being surrounded by that love, just before my very first dance with my husband, is my interpretation of heaven. Sounds beautiful. I really never appreciated weddings until I started photographing them. 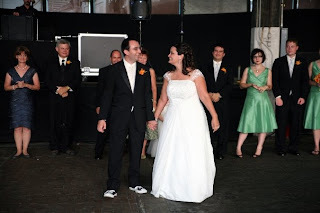 My own was the first and only wedding I'd been to as an adult so I didn't really know how people behaved at them. Now I do and I love them too. Although photographing them is honestly not my favorite thing in the world! Tons of hard work. Aw! Sounds like you had a fantastic wedding!!! That's a perfectly lovely description. Your husband sounds like a very lucky guy. Beautiful picture and pairing with that quote. Here's to a lifetime of happiness for you! Way to comment on two prompts. Lovely picture and description!